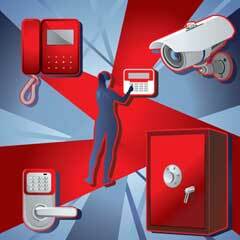 A monitored security system can automatically call for assistance in the event of a break-in or fire. Many security systems are offering additional monitoring services specifically for seniors who live alone, offering the chance for them to get medical assistance if they fall or are otherwise injured in the home. The expense of the security system is relatively affordable, and offers great peace of mind for you and your family. Contact several companies to learn more about your options and the services available. If you need help understanding the contract terms and pricing structure, reach out to a trusted friend or family member to help you make the decision. Check all the locks on every door and window in your home. Make sure they are functional and work to provide protection from break-ins. If any are broken or need replacement, opt for high-quality locks. Keep all doors and windows locked at all times to ensure your safety when you are at home and when you are away. Security systems also install alarms on doors and windows and can alert you and the authorities if any of these alarms are triggered. Keep any spare keys to any of these locks with trusted friends and family members rather than hidden somewhere on the property. Outdoor lighting is not only critical for your safety if you are out at night, but it can also help you see potential intruders lurking around your property. Lighting should be near all exterior doors, and provide adequate coverage of any walkways. Consider installing motion activated light, so you can keep the system energy efficient but be alerted when any movement takes place on your property. If motion activated outdoor lighting is not practical for you, consider using a time lighting system that will allow you to simulate being home even when you are not. If the front door of your home does not have a peephole, or viewer window, replace it with one that does. This will allow you to see who is at your door before you open it. Alternatively, you can install an intercom system to communicate with people outside your home before deciding whether or not to let them in. Never open the door for anyone you do not recognize. Contact the authorities right away if someone attempts to forcibly break in. As a senior, it can be hard for you to take care of outdoor chores such as mowing the lawn. Burglars may notice the lawn has not been mowed in a significant amount of time and therefore think the home has been abandoned. By asking your friends and neighbors for assistance with these types of chores, burglars will see a regular amount of activity around the home, which deters them from attempting to break in.